Celebrate 10 Years Of Life In Color In Lansing, MI! 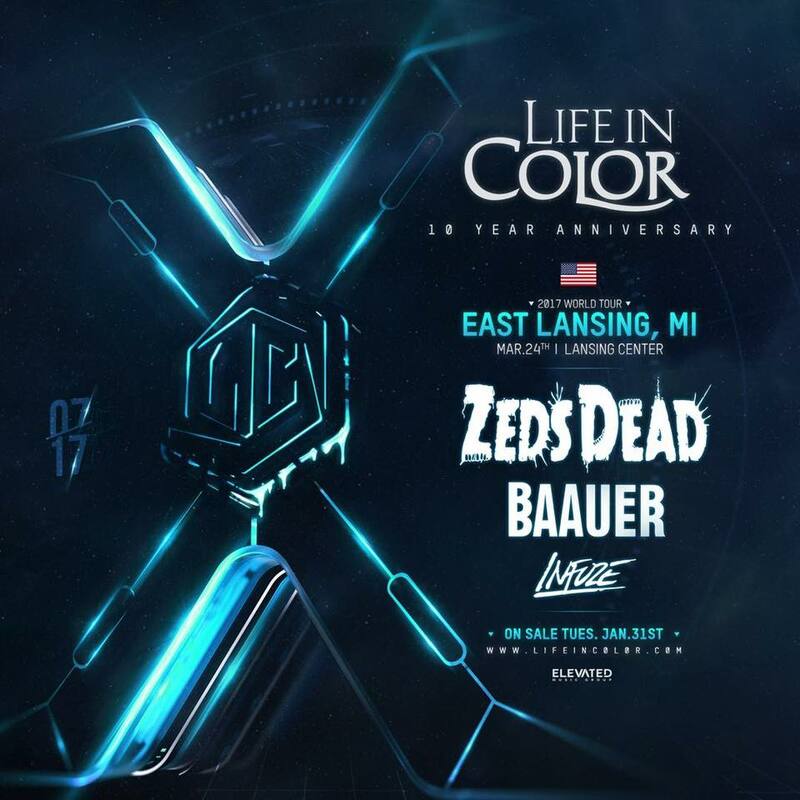 Life In Color's 10 year anniversary tour is to hit Lansing, MI March 24th with Zeds Dead, Baauer & Infuze! Tickets go on sale January 31st on the Life In Color website! "Living Color really embodies our deep love for Disco and Soul music. The inspiration was to really pull feelings and instruments from our favorite era of Disco ('79-80) but for the production and arrangement to feel current and new, yet timeless at the same time. We wanted to make something that doesn't sound like a trend or something that might be expected of us - but more a culmination of who we really are as artists and what has inspired us the most. Father Dude is an amazing vocalist, and we love how the song ended up with a feel good vibe that just flows. We're on tour and brining along the homie Puppet! Tickets - bit.ly/savoytickets"
New Years Eve is always a big deal, but this year the Sub.Mission crew kicked it up a notch at their brand new venue The Black Box. It has only been open for a little over a month now, but the place is already bringing in some major talent for the people to enjoy. 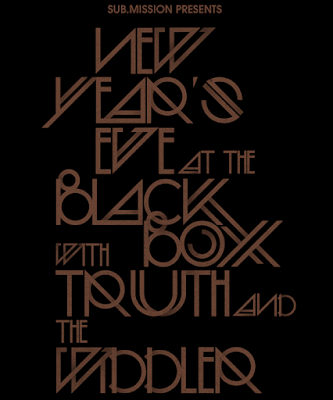 For their new years bash they brought out Truth and The Widdler, and tickets went flying. Pre-sales were sold out and a few lucky patrons were able to get the limited remaining tickets at the door. A line formed around the block at 13th and Grant about a half hour before doors opened, the Denver bass family was ready to get the champagne poppin. This was my first time at The Black Box and I must say they did it right. It's a cleverly designed place with two good size rooms and a fenced in outdoor smoking area to mosey around in the back. A capacity crowd is just about 500 people, so be sure to hop on tickets when you see your favorite bands coming through town. 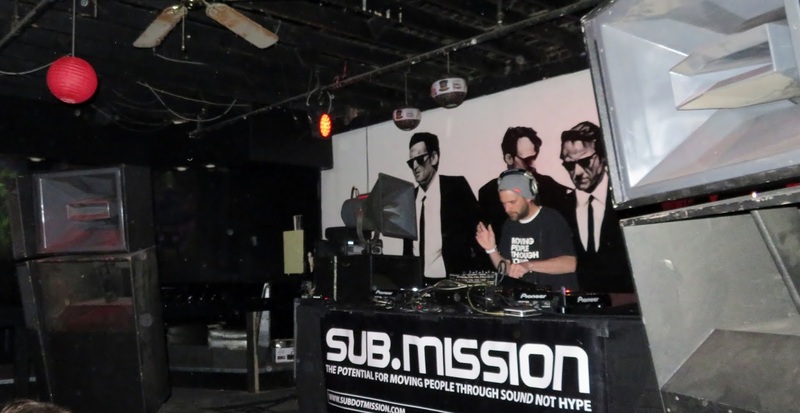 The Sub.Mission Electronic Tuesdays formerly held at Cervantes Other Side are now being held at The Black Box too. If you were like me and still haven't come through, don't slack any longer, get down here and check out this venue it's a great spot and the people in charge are all awesome! The Lounge is the first room you enter through the front door. First thing you will notice is a pair of huge towers of elite speakers, nearly as good as any other clubs main stage. A bar sits just beside the stage and above the bar is an elevated front of house box. There are a few sit down restaurant style booths in the back of the room to rest after prolonged dub-stepping. Also sections of the room can be used for merchandise displays, and for this show there were unique paintings available to purchase. Massive black light art can be seen providing a backdrop for the stage in the Lounge. In between the Lounge and the outdoor area is a small gaming section with a few arcade classics, as well as a pool table in the corner. Once you get to the outdoor area you are inundated with visual esthetics. Covering nearly every wall outside is some form of art, either giant murals, custom plywood cutouts painted, and other cool art projects, everywhere you look you see something pleasing to the eye. The outdoor area is surrounded by trees so during the summer months they will provide a natural canopy. Back inside as you walk back through the Lounge head back towards the front door and go through the big doors to the right you are now in The Black Box room! 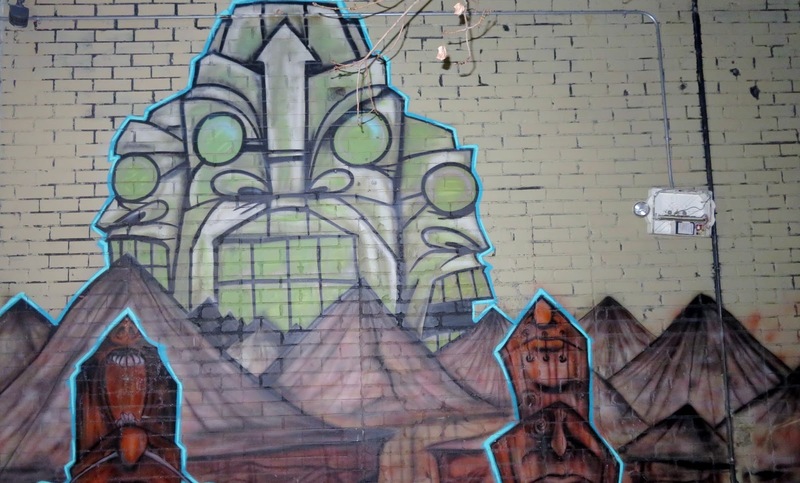 First thing you will notice is this huge mural painted on the back wall behind the booth. It is displaying all the guys from the film Reservoir Dogs. Also you will notice a set of four towers of speakers and wow do they ever pound out bass. Not only that but the mids and highs sounded very fine tuned as well. Very positive vibrations, and not just from the sounds but also the crowd, as everyone was pleasant and happy to make space for everyone else to dance. To the left when walking in the room is a slightly elevated deck that helps those in the back corner of the room see over those in the front. A second bar can be found in the back right of the room, again with an elevated front of house booth right above the bar. The room is completely blacked out, thus the name The Black Box. Starting out the night in The Black Box was Subliminal one of the fine producers reppin Sub.Mission. He layed down some ill beats building up to more and more dubstep from a mellow intro. The room already had a hundred or more people boppin around as the line out front started to enter the building. Subliminal was a perfect opener to get the juices flowing and start the celebration. Back out in the lounge six different Sub.Mission producers matched up in all combinations in order to create a very diverse display of back to back sets. It's was almost like a battle of the back to backs, and all night they did a good job keeping it live in the Lounge. The guys representing in the Lounge were: Caustik, Dillard, CurlyOnE, Sektah, AOWL, and Ind33p. One of the most obnoxious drops I can remember was early in the night where Celine Dion's "My Heart Will Go On" was mixed into the set. Definitely an unexpected song to hear, but it was humorous and the people mockingly screamed the lyrics out. The guys in the Lounge did a good job keeping the people on their toes in transition between the Black Box room and outside. 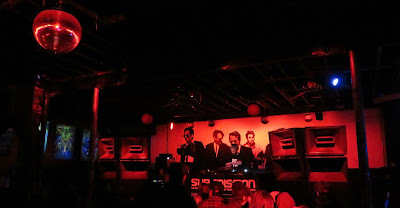 I found myself stopping and observing a lot of the guys spinning in The Lounge, because they were dropping bangers. 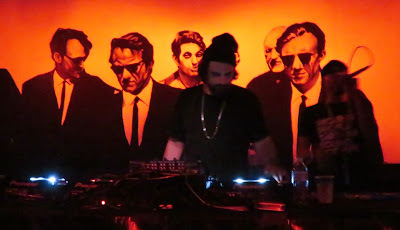 The Black Box room really began to tighten up as The Widdler took the stage. He brought the hype meter up a lot getting into some harder bass music. 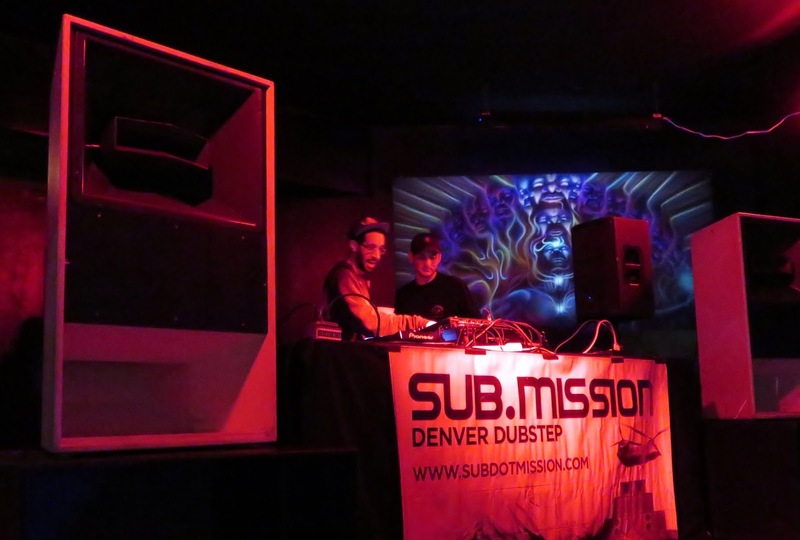 The Widdler was good at transitioning between Riddim, Dubstep, Glitch-Hop and even some Reggae-dub. It was impossible not to at least bob your head while The Widdler blended beats. This was my first time seeing the Widdler live, and now I'm hooked! He is a very nice guy too, he addresses his fans with love and I was able to give him props as he left the stage, he was very appreciative. 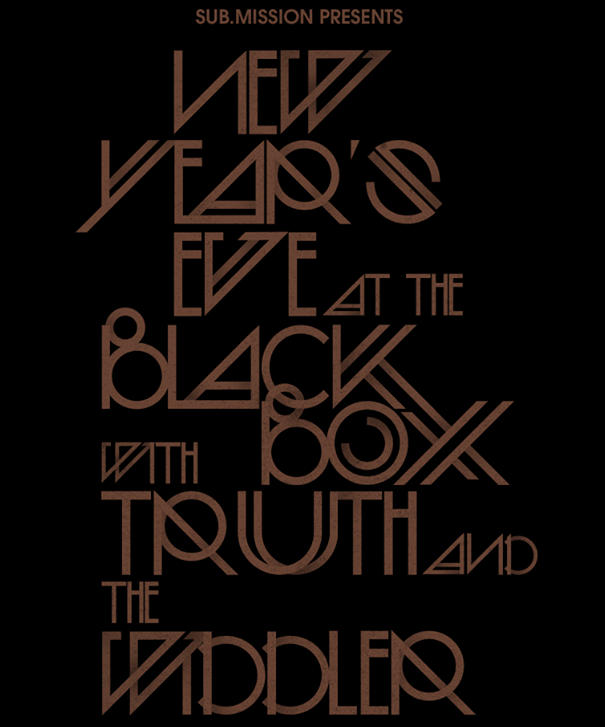 Just before midnight struck The Widdler stepped aside and helped for a smooth transition into Truth. The night went fast because it was so much fun, and before I even realized it Truth was on stage and starting to count down the last seconds of 2016. Truth consists of an MC (Tristan Roake) and a DJ/Producer (Andre Fernandez) and they come from all the way out in New Zealand. Tristan started out by giving shouts the the Black Box and Sub.Mission. Then Andre hopped on the mic and said, "Yo, Happy New Year everybody. Who is ready to party? It's 2017! 2016 is over so let's do this!" 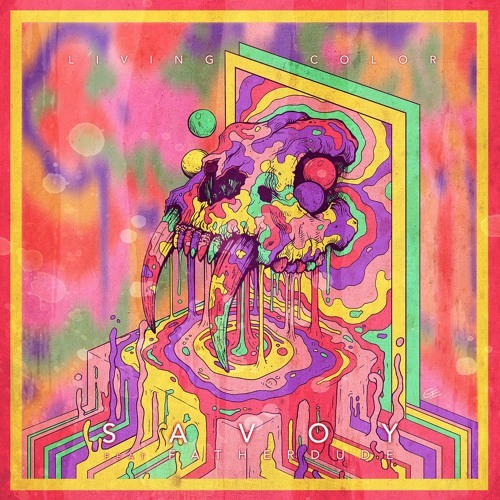 Truth put it down with mad flavor for this set, going into a bunch of different sub-genres of electronic music including: Glitch, Dubstep, and even a sick Jungle section. 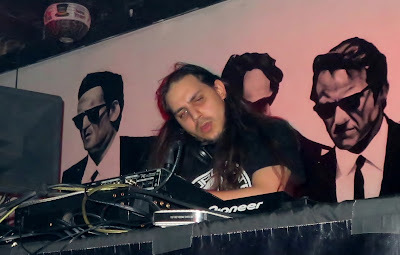 Every time a recognizable track was mixed in the people got very vocal with their approval, especially the dudes in the front row, they went ham all night. For the final 30 minutes of the performance Truth brought The Widdler back out and they went back to back for the final half hour of the night. The place was super fired up for this, and at nearly every drop you could hear someone yell out, "OHHHH!" The two worked very well together in a back to back format. Whoever was about to be tagged in would always have such a perfect song for the switch, it seemed effortless, but surely that's just because these are very talented producers. Man, what a great night! Thanks to everyone involved in making this show so special. Much love to Sub.Mission and all they do for the electronic music scene, without you guys this wouldn't be the Bass Capital. Make sure to like and follow The Black Box on facebook by following the link for future show announcements and contests. This is a new year and a new era is starting, you don't want to miss what is coming next.